The beautiful paper is from My Minds Eye, you probably can't tell from the photo, but there's glitter on the reindeer and snowflakes. 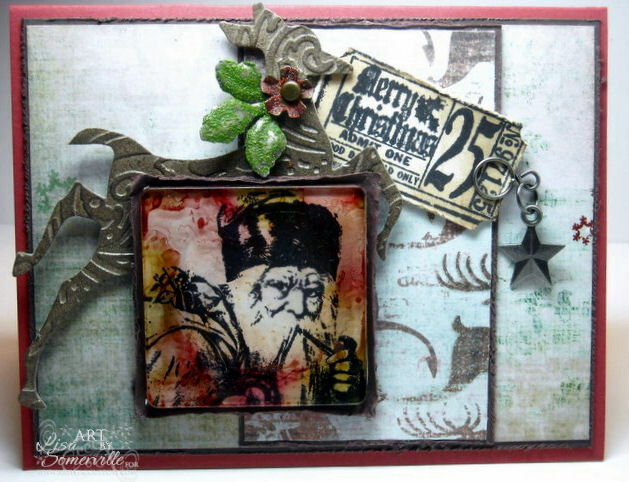 The cool Tag sentiment is from the 100th Collection by Tim Holtz, and the reindeer is recycled from the Tag I made in Tim's Class at CHA earlier this week. I'm not a tag person, and Santa needed something behind him, so I thought the reindeer would be perfect! Awesome job! I love the tinted piece! Christmas is in the air! Beau-ti-ful, as always! Now, how did I miss seeing you at CHA?! Lisa so glad you made the challenge! Love that you added the torn frame behind the fragment and the reindeer is a perfect touch! Love it! Great way to recycle that reindeer, it looks perfect behind that beautiful Santa! Just beautiful! Great idea for the reindeer, he'll get a lot of milage, won't he! Great challange! I'm so glad you found the time to play along, Lisa! This is an absolutely gorgeous holiday card, and a perfect example of beautiful the tinted fragments can be! The tag and reindeer are just right, too! I'm glad you had fun at CHA! I hope you get some time to relax now! This is just great Lisa. Love the vintage Santa with red surrounding him. And the reindeer is just perfect. Oh my, this is gorgeous!!! I will definitely have to do some fragments with that stamp set for Christmas - what a perfect combo. Love the reindeer in the back, too! Lisa - this is a wonderful card. I'm so loving Tim's book and his style is so awesome...I have a hard time pulling it off though. But YOU - you've really captured the true intention of this technique. Absolutely fantastic. It was good to see you at CHA...only wish we had more time, girl...we need to fix that next time! I really got behind in viewing your blog. However, it makes for a wonderful evening to view your gorgeous work. I love your fragment with Santa.